Paul Orsulak and me practicing for our percussion recital, late 2009 - this same instrument heard on The Gathering Mist albums! To audition for the college I would eventually graduate from, I needed to perform a snare drum piece, a timpani piece, and a mallet piece, along with whatever else was involved (sight-singing, yada yada yada). I spoke with Nancy Zeltsman (before I really knew who she was) and she gave me a 2-mallet marimba solo called “Hegira” for my audition that one of her students, Carrie Magin, had composed, along with a CD for reference which helped a lot (Thanks Nancy!). I spent every night in a practice room learning that piece in addition to the famous timpani piece “March” by Elliot Carter – turns out its a really fun piece with stick-flipping, quintuplet and septuplet phrasing, and polyrhythms – my favorites! 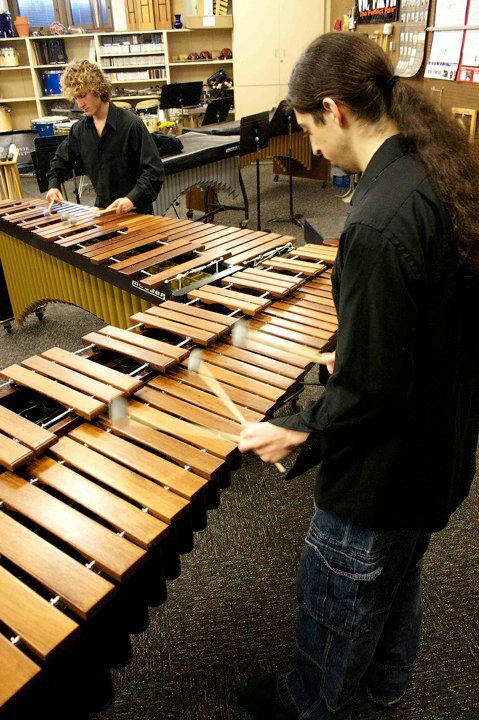 So I got more and more used to it, and ended up playing the huge 5-octave marimba with 4-mallets for two pieces in my senior recital (another piece only required 2 mallets but was WAY more difficult, go figure), as well as a few other pieces for other recitals here and there. My experience with the marimba happened at a good time too – right as I was getting into other forms of melodic percussion – especially the Kalimba and HAPI Drums. Anyway, why I’m posting this: I ended up overcoming some difficulties I guess and now I’m proud enough of the results to include it on a few tracks for The Gathering Mist – Enjoy!